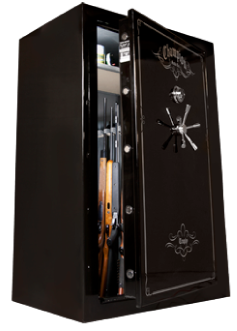 Trophy Series Gun SafeBuilt with the same exacting precision as Champion’s higher-end models, the Trophy Series offers elegance and rugged protection. It’s 11-gauge steel body and thick composite door with numerous 1¼”- diameter four-way active door bolts provide excellent security. To protect from the hottest fires, it boasts a 1500° 75-minute fire rating. The Trophy Series comes in high-gloss and textured finishes, with a velour covered interior and convenient door organizer.